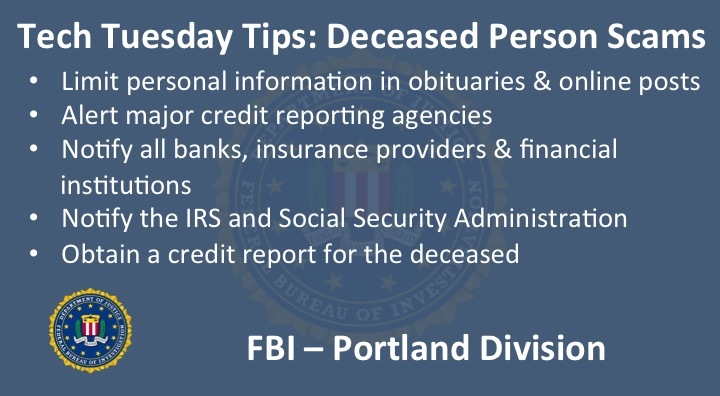 Welcome to the Oregon FBI's Tech Tuesday segment. This week, building a digital defense against scams targeting your recently-passed relatives. The death of a loved one can take an enormous toll -- physically, emotionally and even financially. Beyond that, there are online scammers who will try to cash in on your already-difficult situation. The fraudster could try to open new credit cards in the deceased person's name or use a phishing scheme to pressure a grieving spouse into paying for a bogus benefit. Perhaps he says that he is calling from an insurance company and is able to re-instate an expired life insurance policy if she just makes a payment to cover the last few years of unpaid fees. ID thieves may even try to use the deceased person's Social Security number to create a new identity. 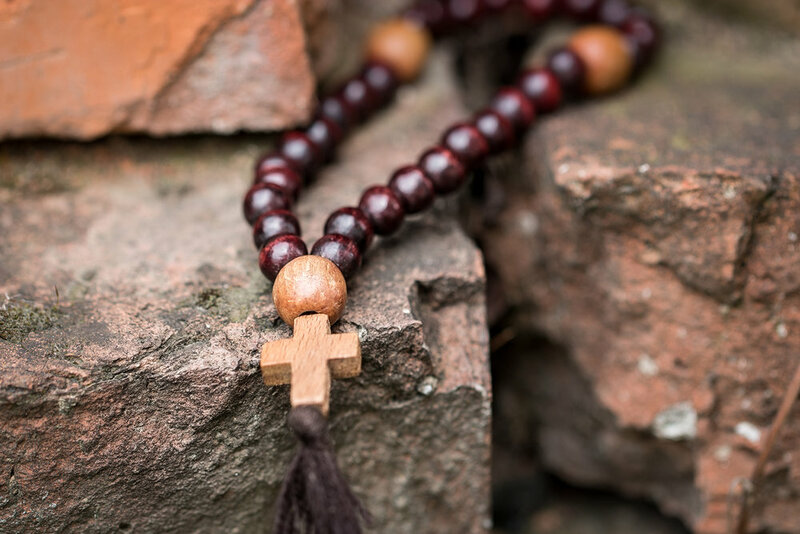 So how do you protect your family after the loved one has passed? Limit the information you put in your loved one's obituary or post online, including on social media. For instance, know that scammers are looking for dates of birth, mothers' maiden names, addresses and other personally identifiable information or PII. Alert the major credit reporting agencies as soon as you can as to the passing. They will want copies of the death certificate as well as specific details about your relative, including date of birth, Social Security Number, full legal name and recent addresses. The agencies will flag the person's credit file and put a freeze on it to prevent others from opening new unauthorized lines of credit. Make sure to also notify any current banks, credit unions or financial institutions that the deceased person used so that all checking, savings, investment or credit card accounts can be flagged appropriately. The same thing for insurance companies holding auto, home or life insurance policies. Check with the financial institution to see what access survivors' are entitled to and what protections will put in place to keep scammers out. Send a copy of the death certificate to the IRS so that the person's tax account can be flagged as well. Send the death certificate to the mailing address that the deceased individual would normally use to submit tax returns. You may also submit a copy of the death certificate when you file the person's final tax return. Sometimes your funeral home will notify the Social Security Administration -- but if not, you should do so right away. Finally - obtain a credit report for the deceased person right after death and a few months down the road. This will help you to identify any otherwise unknown accounts and to watch for any attempted fraudulent activity after the death. If you have been victimized by an online scam, be sure to report it to the FBI's Internet Crime Complaint Center at www.ic3.gov or call your local FBI office.